The Pitch: We’re off to make the wizard, the wonderful wizard of Oz. The Review: Origin stories are a curious phenomenon. It seems you can’t start a comic book franchise without first explaining how characters have obtained their superpowers, as if some justification is required for otherworldly abilities rather than just plain, old fashioned story-telling. The question will always be if these stories are worth telling: no one has yet decided to put pen to paper to attempt to explain whether the Three Little Pigs had endowment or repayment mortgages, or wondered whether The Three Bears sourced the home furnishings that so aggrieved Goldilocks from IKEA or some other home furnishing store. But Sam Raimi has seen a gap in the market: how did the man behind the curtain get behind the curtain in the first place? Is the wizard’s story as compelling as that of Dorothy, or indeed any of the other characters outlined in L. Frank Baum’s fourteen novels based in and around the land of Oz? As with any venture which calls on well-known or beloved characters, there’s a risk of going too far to either extreme; if you don’t use the existing characters enough, then you’ll alienate the core audience, but fail to include freshness or originality and your purpose will seem false. The restriction that Raimi and Disney had to work under is that Baum’s original novel is now in the public domain, but the original Warner Brothers adaptation from 1939 isn’t, so elements introduced by that adaptation were strictly off limits. This still leaves a pretty open playing field, as long as you don’t want to be wearing ruby slippers (originally silver in the novel), but since this is the wizard’s story, not Dorothy’s, there’s less conflict than you might think. Some excised or ignored elements from the source do make an appearance here, including a land made of china cheekily renamed Chinatown – but this prequel errs on the side of the familiar rather than the fresh. Indeed, some of the performances feel as if they’ve been lifted directly from 1939, not least James Franco’s cheesy, surprisingly lively interpretation of the titular Oz. Franco’s often gravitated to withdrawn, offbeat roles and it’s certainly the latter, if absolutely not the former in this case. His performance might be an acquired taste, but it’s just one of a number of broad turns which include the witches three (Michelle Williams, Rachel Weisz and Mila Kunis) and some motion-capture LOLs from the wizard’s sidekicks (Zach Braff and Joey King) that stop just short of pantomime. The overall feel is very much in the same vein as Tim Burton’s recent Alice In Wonderland, from the neon brightness of much of the CG backgrounds to the typical Danny Elfman score, but with Raimi, as he so often did with the Spider-Man films, just occasionally adding his own specific flourishes. 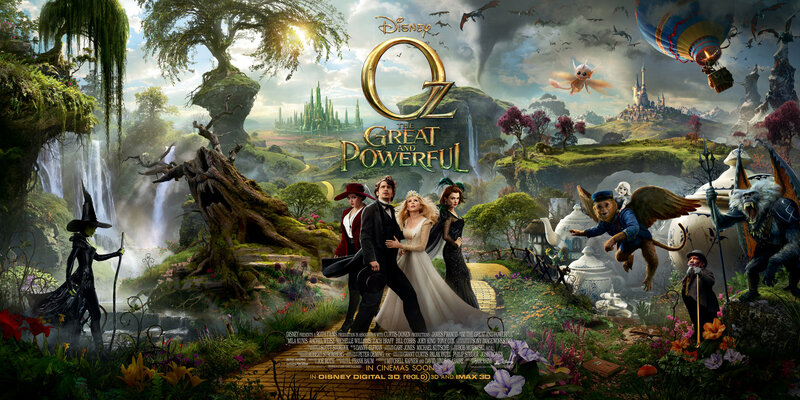 What unfolds over the slightly bloated two hour plus running time can be broadly broken down into three phases; the opening twenty minutes, shot as the original Oz was in black and white before unleashing the colour, and featuring some faces of the key players in both narratives; then the tornado lifts Oz and his balloon and it’s practically a theme park ride until Oz encounters other characters in what at first appears to be a sparsely populated land; and finally we settle into the actual story, where Oz looks to understand who he really is. If that sounds like the sort of hackneyed moral that normally underpins middle of the road animation, then it absolutely is, but the gentle humour and the simple characters actually serve to elevate it. It’s hardly revolutionary, but there’s a certain amount of charm in watching how the various elements of the original story fall into place, and while it can’t compare to the 1939 Wizard adventure (or indeed, even the dark charms and originality of the almost cult classic Eighties sequel Return To Oz, which did a better job of drawing on the source material), it’s an entertaining ride that just about justifies its existence. Why see it at the cinema: Raimi goes big on the visuals and throws in a few trademarks, including POV shots, and there’s no shortage of spectacle or detail, all of which make this a worthwhile experience to make the trip out for. Why see it in 3D: You’ll notice that the title of this review doesn’t have a “3D” suffix as I saw it in 2D, but I’m going to strongly recommend that you see it in 3D if you can based on what I saw. Not only does Raimi have a good go at two different styles of 3D, including the waving-stuff-in-your-face and also the layered perspective mastered so well by Ang Lee in last year’s Life Of Pi, but seemingly to compensate for the brightness issues of 3D the day-glo aspects have been ramped up, and there were a couple of scenes which cut from darkness to bright sunshine quickly which caused my corneas to attempt to retreat into the back of my head. Even now, the next day, I think there may be images of flying baboons seared onto my retinas, so if you can see this wearing sunglasses – frankly in 2D or 3D – I’d suggest it’s the better option. What about the rating? Rated PG for mild fantasy threat. The key line is in the BBFC’s extended classification info, where it states that “a PG film should not disturb a child aged around eight or older.” I would just advise a little caution if taking children younger than that, as it’s an occasionally dark film that might trouble the very young. The Corridor Of Uncertainty: Tidy. Just three trailers and a meagre selection of public service announcements meant that it was a mere 21 minutes between advertised start time and actual film start time. This entry was posted in Reviews and tagged 2013, films, James Franco, movies, Oz The Great And Powerful, prequel, review, Sam Raimi, Zach Braff.